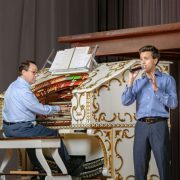 Classical/Crossover singer Daniel Mata will perform with Ken Double and the Mighty Wurlitzer at the 37th Annual Ken Double Variety Show, June 8, 2019. 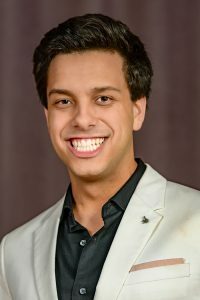 Daniel Mata just concluded his senior year at Belmont University in Nashville, TN after being awarded the prestigious Hearst Scholarship. Born in Venezuela and one of triplets, Daniel’s journey with his family to the U.S. is a great success story. His vocal skills were apparent early in life, and at age 14, he won the Stars of Tomorrow contest in Atlanta; has performed on the stage of the Atlanta Fox Theatre; sung at the Basilica at St. Peter’s in Rome; performed with the Chattanooga Symphony Orchestra; and is proudly announcing his first CD recording, Born To Sing, a dual effort with Ken Double at the organ. 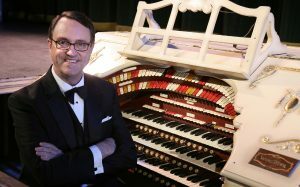 Giving Tuesday: Ken Double in “Support Your Local Wurlitzer”! Some of us are old enough to remember the film “Support Your Local Sheriff”… .. and some of us aren’t. But either way, as LCTOS President Ken Double notes in this video, Giving Tuesday is a wonderful day to make a gift in support of the Mighty Wurlitzer! http://lctos.org/lctos/wp-content/uploads/2018/01/Steamboat-NSB-8-1-28-18web-e1517718746720.jpg 435 600 Amy Brinkley http://lctos.org/lctos/wp-content/uploads/2017/11/LCTOS-Small-Logo-1.png Amy Brinkley2018-11-25 18:55:132018-11-25 19:29:02Giving Tuesday: Ken Double in "Support Your Local Wurlitzer"! 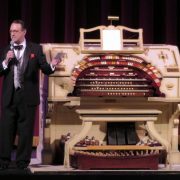 I am writing because it is an exciting time for the Long Center Theatre Organ Society and the Mighty Wurlitzer! We will have plenty to report in our next issue of Vox Wurlitzer, which will hit your mail boxes and emails soon. But in the meantime, here are some great opportunities for you to enjoy the Mighty Wurlitzer of Long Center. On Sunday, October 21st at 2:30 p.m., yours truly returns to provide a horror-filled preview to Halloween. 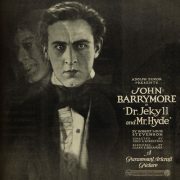 The 1920 silent film Dr. Jekyll and Mr. Hyde features the virtuoso touch of John Barrymore, then the finest actor in American theatre, making his mark in film. Tickets to hear the Mighty Wurlitzer and see “The Great Profile” in this piece of classic cinema are just $5 at the door. What a deal!! This is being done in full partnership with Long Center, and we say “Thanks” to Eric Van Cleave and the entire Long Center staff for these ventures that are so good for the continuing exposure of the Wurlitzer to the public. And thanks for all of the members of the LCTOS Board who commit so much time and effort for our one-of-a-kind Wurlitzer pipe organ! There will be other special events after the New Year, and of course, on Saturday, June 8th, it’s the Ken Double Variety Show #37! 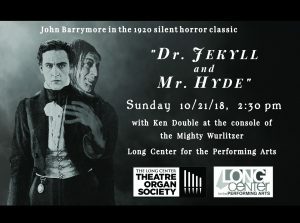 So mark your calendars for a spooky October 21st and Dr. Jekyll and Mr. Hyde. Bring the family and friends for holiday movie fun and the Mighty Wurlitzer. 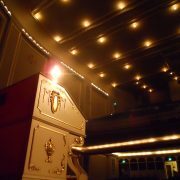 And look for your next issue of Vox Wurlitzer and lots more great news about our great theatre pipe organ. Two years ago I attended a conference at Purdue University. My dad, Jack Byers, had attended there for 1 1/2 years before getting called to serve in WWII. He returned in 1946 to finish his degree in Engineering. He want on to work as a design engineer for Pontiac Division of GM and retired after 33 years. Growing up, he loved theatre organs and took us many times to Detroit TOS for concerts as well as live accompaniment to silent films. He studied organs and helped repair a few when he could. He used this knowledge to eventually buy and install a pipe organ in his church in Clarkston, MI (Methodist Church). At the Purdue conference in May 2015 I skipped a late session and took a slightly different route back to my hotel. I passed a truck on the street and noted that it said, “Organ Repair.” A few feet later I stopped and took a second look, then looked up at the building it was parked in front of. “No kidding,” I thought to myself. “I wonder if this repair man is working on a theatre organ?” So I took a chance and pulled on the door handle and to my amazement, it was open! So I came inside and was greeted in the lobby by a young gentleman who was kind enough to start showing me around. He offered to start up the organ (if the repair man was finished) and after several minutes of warm-up, I heard the glorious sounds that I knew so well. This was where my dad stood so many years ago, and I felt his smile from heaven. Thank you for the thrill and a memory of a lifetime. If the Mighty Wurlitzer has thrilled you also, or if you have a story to share about the Mighty Wurlitzer of Long Center, we’d love to hear it! Share here in the comments or drop us an email at events@lctos.org.